The Island of Hawai’i is the youngest island in the Hawaiian chain and is also by far the biggest, providing a vast canvas of environments to discover a variety of unrivaled natural wonders. This is the home of one of the world’s most active volcanoes (Kilauea), the tallest sea mountain in the world at more than 33,000 feet (Mauna Kea), the most massive mountain in the world (Mauna Loa) and the largest park in the state (Hawaii Volcanoes National Park). All but two of the world’s climate zones generate everything from lush rain forests to volcanic deserts, snow-capped mountaintops to beautiful black sand beaches. Lava reaches the Pacific Ocean at Kamokuna after a seven mile journey from the Pu'u O'o vent in Kilauea Volcano. L.A. Times travel writer Chris Reynolds crisscrosses the Big Island, covering beaches, waterfalls, volcanoes and luaus. A look at the beautiful creature in it's natural underwater environment. A flyover at 800 feet of the Kohala Mountains coastline. Hawaii Island features some of the most picturesque and varied beach landscapes in the islands. Here you’ll find not just white sand beaches but black sand and green sand beaches as well. And along with the beautiful resort beach at Mauna Kea (pictured above), Hawaii Island also has rugged areas such as Puako Beach that are wild and remote. A spectacular oasis that has earned a reputation as one of Hawaii Island’s finest beaches is the largest of island’s white sand beaches, Hapuna Beach. It has consistently been rated on numerous international Top Ten lists. Hapuna also offers consistently good conditions for swimming, bodyboarding, sunbathing and snorkeling. As one of the premier astronomical observing sites in the world, the summit currently has 13 working telescopes. 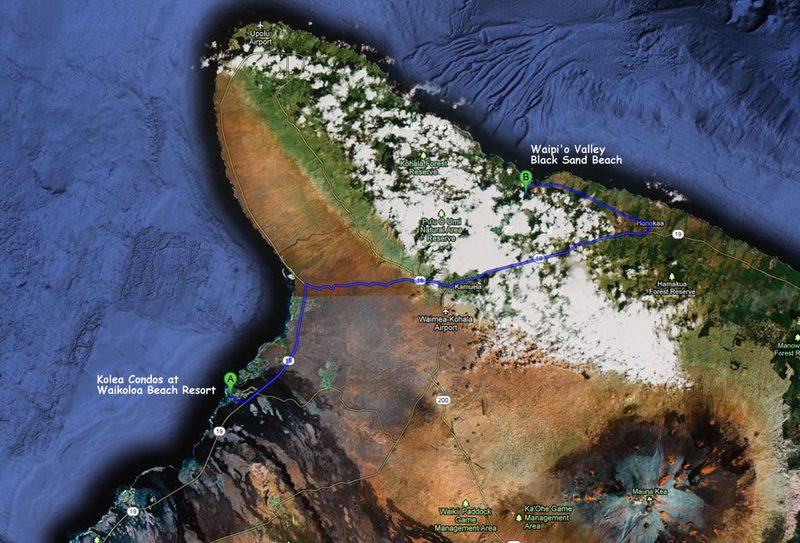 The drive is 58 miles (1.5 – 2.0 hrs) through the interior of the island on the famous Saddle Road. The winding road takes you up in elevation to cloud level. From there, you’ll turn on to Mauna Kea Access Road for ascent to the Visitor Station at 9,200 ft, where small telescopes are set up for star gazing. The newly paved roads accommodate any rental vehicle. Continuing upwards to the 13,796 ft summit requires a 4-wheel drive rental to safely navigate the unpaved, winding road. Anyone considering this drive should first become familiar with all dangers and precautions. Continuing to the summit is merely an added bonus. To truly enjoy the experience, you only need to get to the Visitor Station in time to see the sunset, then do some star gazing from above the clouds. Located on the northern Hamakua Coast of the Kohala Mountains, the sacred Waipio Valley was the boyhood home of King Kamehameha I, and once an important center for political and religious life. Not only is “The Valley of the Kings” an important site for Hawaiian history and culture, it’s also a place of dramatic tropical beauty. This fertile valley is about one mile across and over five-miles deep, and surrounded by cliffs up to 2000-feet high. The beautiful drive is approximately 43 miles (1.5 hrs). Lookout point offers incredible views of the black sand beach below. Continuing down to the beach is not recommended for everyone. It is a strenuous 90 minute hike down the steep 25% grade. If you are capable, and decide to enter the valley, you will find it to be a once in a lifetime experience. We would not want any of our guests to consider driving down the road. Hawaii Island and its clear blue waters are truly a snorkeling and scuba paradise. The island’s Hilo side has a handful of spots, but the Kona side is even more famous for its visibility and calm waters, protected from the winds by the massive slopes of Maunaloa. For snorkeling in shallow waters (beginners to advanced) on the Kohala Coast, visit Hapuna Beach and Anaehoomalu Bay (A-Bay). For experienced snorkelers, “Captain Cook’s Monument” offers beautiful coral with a dramatic underwater volcanic drop-off. To get to the area, you rent a kayak and enjoy a paddle across the calm water in Kealakekua Bay. Last time we were there, we were able to stop our kayak in the middle of a pod of Hawaiian Spinner dolphins that utilize the bay to feed, rest, and nurse their young. In a word… amazing! Volcanoes are monuments to Earth’s origin, evidence that primordial forces are still at work. 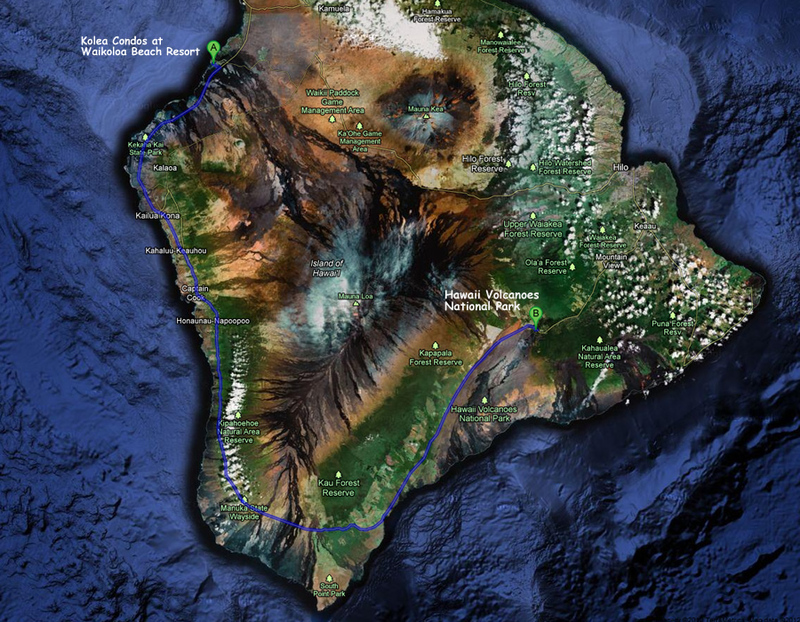 The drive is 119 miles (3 hrs) around the southern end of the island through the lush Kona coffee growing district. You’ll enjoy incredible views of the coastline as you approach Crater Rim Drive in the park, where you’ll see the constant emissions from Kilauea’s caldera. If you’re driving at night, you can’t miss the bright orange glow of Kilauea. The park offers many options for you to see history by driving and hiking. Our favorite activity was the 4mi (2-3hr) hike of “Kilauea Iki Crater”. It took us through the lush rain forest along the rim, and then down 400ft (same as a 40-story building) and across the once-molten, now still-steaming crater floor. Rated “moderate”, the trails are very well constructed, and mostly easy to navigate. You can see the Hawaiian Sea Turtles (Honu) at virtually any Kona beach. On every trip to the island, we have been able to see Honu while snorkeling, and while sitting on the beach. Turtles commonly bask on the beach at Anaeho’omalu (A-Bay), the beach that is connected to Kolea condos. The photo above was taken here. Honu (and all other sea turtles in Hawaii) are fully protected under the federal Endangered Species Act and under Hawaii state law. It is illegal to harass, touch, or swim directly over a surfacing sea turtle. Violators are subject to huge fines and prison time, and Hawaiians will not tolerate the site of a violation. It is ok to swim, snorkel or dive near a turtle as long as you’re not putting the animal under unnecessary stress. It is nearly certain that you will see these magnificent creatures during your stay. It is truly memorable, and one of the very things that we love so much about Hawaii Island. The diverse culture of Hawaii is expressed in language, music, art, theater, dance, film, cuisine, and a multitude of festivals. At the core of each is the spirit of aloha, seen in the fluid arc of a hula dancers hands, and heard in the soft rhythm of a slack key guitar. Warmth, open-hearted generosity, and passion tempered by gentle humor are the primary elements of aloha. The Big Island is home to some of the most historic places in all of Hawaii, from the site of Captain Cook’s death, to the birthplace of King Kamehameha. This is an incredible way to see the entire island, we highly recommend it! You’ll never forget flying over volcanoes, into valleys, and along the beautiful coastlines. Our own tour was through “Blue Hawaiian Helicopters”, and it was wonderful. Their helipad is located just a few minutes from Waikoloa Beach Resort. We elected to book the newer “Eco-Star Helicopter” with the better site lines, and found it to be worth the cost. The pilot also doubles as a knowledgeable tour guide, and captures your entire tour on a DVD that we recommend purchasing afterwards. 100% pure Kona coffee is a rare commodity exclusively grown in north and south Kona. The high elevation, constant cloud coverage and rich volcanic soil from Hualalai Volcano in the upland slopes of Kona create an ideal environment for harvesting this unique Hawaiian coffee bean. There are hundreds of coffee farms in Kona, from the small art town of Holualoa to Kealakekua, and many offer tours to the public. So sip a freshly brewed cup for yourself and experience the rich aroma and flavorful taste of 100% Kona coffee. The Hilo region is blessed with dramatic waterfalls, fertile rainforests and blooming gardens; the geographic flipside of the volcanic Kohala Coast. South of Hilo is the “Puna” district. This area on the eastern tip of the island stretches from the sea to the 4,000 ft summit of Kilauea volcano. On the coast you’ll find roiling ocean, black-sand beaches and a spring warmed by the volcano’s steam. 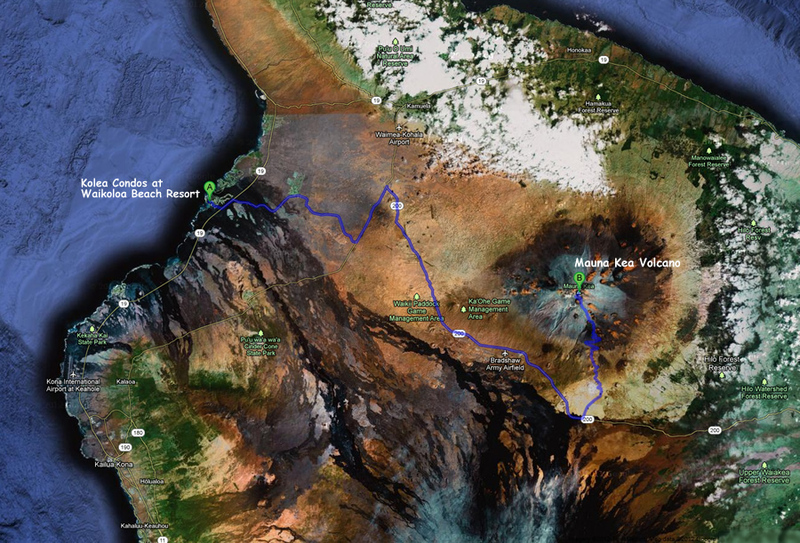 Towards the volcano you’ll find rainforests, steam vents and the rugged landscapes of “Volcanoes National Park”. Puna’s most dramatic destination is Kalapana, a community that was partially covered by the lava flow in 1990.